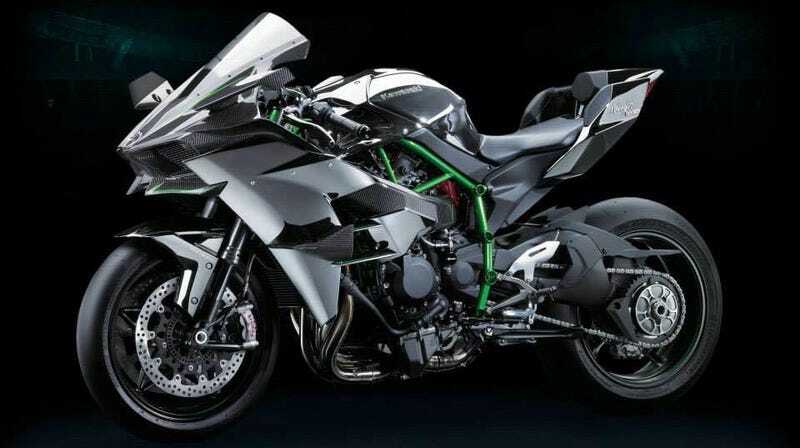 The Ninja H2R is something completely different from Kawasaki. It's supercharged, has a trellis frame, carbon fairings, and freaking wings. This is racing prototype-level stuff, and these are the first pics. The prevailing wisdom right now – less than a day ahead of the bike's debut – is that two versions of Kawasaki's new machine will be available: a street version (the H2) and a track model. This is the latter. The H2R. Think of it as the Kawasaki's version of the Ducati Desmosedici. Slick tires, no signals, no headlight, lots of carbon fiber, and an obscene, track-ready price tag. It's completely nuts and purely pornographic. More details as we get them.